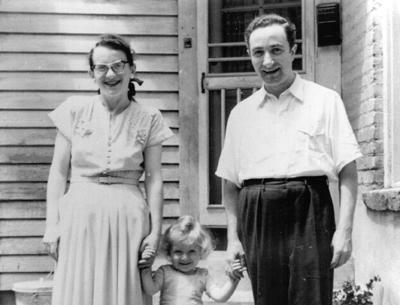 Holocaust Survivors: Photo Gallery - "In the USA"
Rachel, Martin and Joseph Sher stand outside of their new home, a furnished apartment on Milan Street in New Orleans. The Shers left DP camp in Germany and settled in New Orleans, where Rachel had a aunt. The Shers were one of the first survivor families to settle in New Orleans. Mr. Sher took a job at Harry Hyman Tailors and remained there for 34 years. Martin soon was joined by a brother, Leopold.